Robert T. Ironside: I... LIKE... burned toast. Q: Whatever happened to the van? Q: What is the building often seen in each episode that is both home and office of Chief Robert T. Ironside? Hardly any actor so credibly reinvented himself as many times as Raymond Burr. In the late 40's into the mid 50's he often played the villain, usually in westerns and noirs, and once he even had a minor but crucial role as the villain in Hitchcock's "Rear Window". Then there were all those years playing unbeatable defense attorney Perry Mason that I figured he'd be typecast forever after that series ended. However, he did such a credible job playing the wheelchair-bound Ironside that the staff at restaurants were surprised when he would show up for reservations walking in on his own two legs. The show had camera-work that was ground-breaking without being annoying, there was a feeling of family and camaraderie among the cast that oddly enough reminds me of Joss Whedon's "Angel" in that regard, it had much better plots than the other ensemble cop shows of that era, and it even had lots of counter-culture material that worked out pretty well without being cheesy or preachy considering the age of its main star, Burr, who was 50 when the show premiered. The premise of the show is that while vacationing in an isolated farmhouse, Robert Ironside is shot by an unseen assailant. The result of this wound is that he is paralyzed from the waist down. 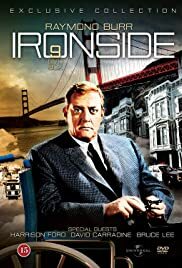 Accustomed to being Chief of Detectives, and not wanting to be put out to pasture, he turns to his old friend, the Commissioner of Police, who makes him his Special Consultant so that Ironside can go on working on cases rather than face living the life of a retiree on a disability pension. The supporting cast, and his team in solving crimes during the series, consists of rookie detective Ed Brown, policewoman Eve Whitfield, and somewhat reformed juvenile delinquent Mark Sanger. Up to this time, police detective shows had consisted of able-bodied young white men dressed in suits complete with hats, no matter what the occasion. This was one of the first TV shows of that genre - maybe the very first - to mix things up with an interracial cast, a policewoman who was an integral part of the team, a handicapped leader, and a member of "the establishment" in Ed Brown thrown in for good measure. If this formula sounds a lot like Mod Squad, that's because it is, except Mod Squad came out the following year on the coattails of Ironside's initial success. 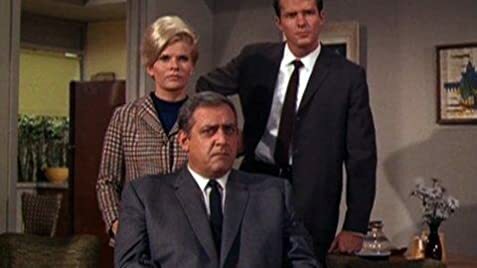 Ironside had its share of guest stars that made it big in later years. In this first season keep a lookout for a young Harrison Ford in "The Past is Prologue", for Ed Asner in "The Fourteenth Runner", and Susan St. James in "Girl in the Night".